On August 15, the population of the world's sixth smallest country - Liechtenstein in case you hadn't guessed - will be on holiday to celebrate their Staatsfeiertag, which we will call national day due to the simple fact that there is no proper English translation for its original German term. It does not really matter anyway, as your regular Liechtensteiner would probably tell you that he will be joining the fun at the Fürstenfest, something along the lines of Princely Celebrations, as that's how the day is colloquially called. Nobody seems to know as to why exactly the Fürstenfest, Staatsfeiertag or National Day came into place. There had been celebrations of a similar scale before, for example when for the first time a sovereign prince visited the country in 1842, or for anniversaries of the country or its princes (though sometimes without those celebrated). It seems likely that World War II and the constant threat by National Socialism played an influencing factor in the decision to invent a national holiday. Whatever the reason, the government of the Principality declared August 15 as Liechtenstein's national day on August 5, 1940 and it took place for the first time just ten days later. The day was chosen for two reasons. On the one hand, it was already a public holiday as the Catholic world is celebrating Virgin Mary's ascent to heaven (known as the Feast of the Assumption) that day (and Liechtenstein is a staunchly Catholic country), while on the other hand it was the day before the birthday of Prince Franz Josef II, who had come to power two years earlier. Celebrated for the first time in 1940, some 50 years later a law was passed to make August 15 Liechtenstein's official national holiday after the death of Prince Franz Josef II in 1989. 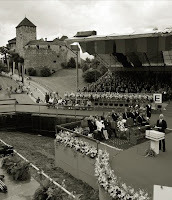 National day in 1990 was a very special one as it also included the ceremony of homage of Prince Hans-Adam II. Throughout the decades, the National Day had many different forms of appearance which evolved through the years. These days, the official celebrations kick off with a procession of the Princely Family, dignitaries and a bunch of other people down from Schloss Vaduz to the castle meadow situated nearby. During the ceremony on the castle's meadow which has been taking place since 1990, speeches are made by the sovereign prince (or his regent) and the president of the parliament. For a few years, a field mass was also celebrated but isn't anymore since 2011 due to quarrels between Archbishop Wolfgang Haas and the political scene over a couple of topics, including the seperation of state and church as well as gay marriage. The act of state ends with the singing of the national anthem which would probably sound familiar to you as it is set to the same tune as the British national anthem. After the official celebrations are over, the Princely Family, as well as the five-member government, the 25 MPs, and the straggling masses head back to the rose gardens of Schloss Vaduz for drinks and chatter. It is the only time of the year that the public gets a chance to visit the castle's gardens. Up until a few years ago, there was also food but it seems that even one of the world's richest countries has to be pennywise these days. Throughout the whole day, a public festival is held at Vaduz. During the late afternoon and evening hours, the Princely Family also mingles with the citizens at said fair. On National Day all bus services in Liechtenstein are for free and there is no entrance fee to the country's museums. As soon as it gets dark, another highlight of the day fastly approaches. Before the Fürstenfest culminates in a stunning fireworks display, there is a torchlight parade as well as mountain top fires, a tradition that dates back a few decades. Already in 1939 on the day of the homage of Prince Franz Josef II, Liechtenstein's scouts had organised a torchlight procession to show the people's alliance with their new sovereign, the monarchy and the country itself. At the time, the country was in a precarious situation as the Anschluss of Austria had recently taken place and National Socialist forces in the Principality were advocating for something similar to happen with Liechtenstein. With the slogan "Liechtenstein for the Liechtensteiners!" they campaigned against Prince Franz Josef II. In March 1939, there was a coup attempt and only after a pact between the main parties to keep the date a secret, they were barred from participating in the elections that year. A few months later on the eve of 16 August, the birthday of the new Prince Franz Josef II, a group of scouts with torchlights firmly in hand made their way from the Rhine river up to the mountain tops of the alpine Principality. Near the Gafadura alp, around 300 fires formed a crown with a diameter of about 50 metres. 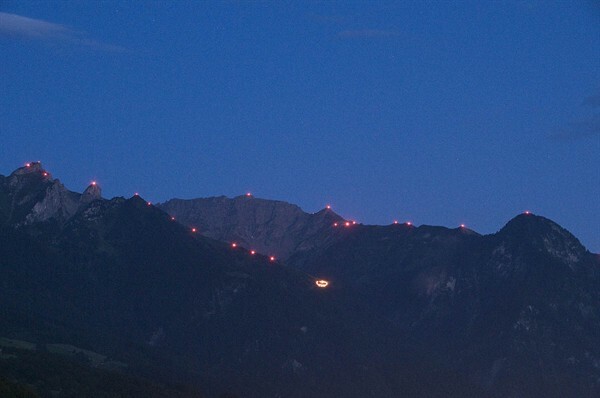 In addition, there was a procession of torchlights over the Fürstensteig, an alpine hiking trail. During the year 1939, it wasn't an uncommon sight in Liechtenstein to see fire crowns consisting of sawdust burn on the mountain tops. The scouts regularly lit the symbol of the monarchy for everyone to see in order to fight the German National Movement in Liechtenstein (VDBL), a National Socialist party, and their youth organisation who, by contrast, lit large swastikas. After not being able to take part in the elections and the outbreak of World War II, the support for the party declined heavily and the country remained neutral during the war. Both the procession and the "Crown of Tuass" above Triesen (albeit the latter changed location since 1939) still take place today though the scouts have been replaced by members of the mountain rescue. In addition, there are fires on most of the other mountain tops of the Principality. The day is rounded off with a about thirty minutes fireworks display over Vaduz which ends with the words Für Gott, Fürst und Vaterland (For God, Prince and Fatherland), Liechtenstein's motto, being lit. For more information about this year's Staatsfeiertag, have a look on its official homepage.